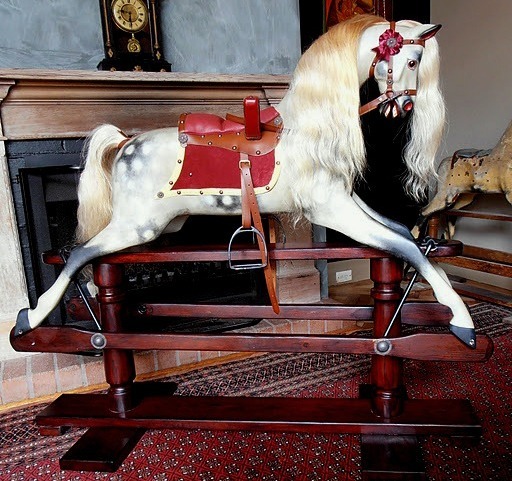 An old rocking horse in well-preserved original condition, complete with scuffs and scars, has its own character and beauty; its personality is very different story from one that has had a major overhaul. 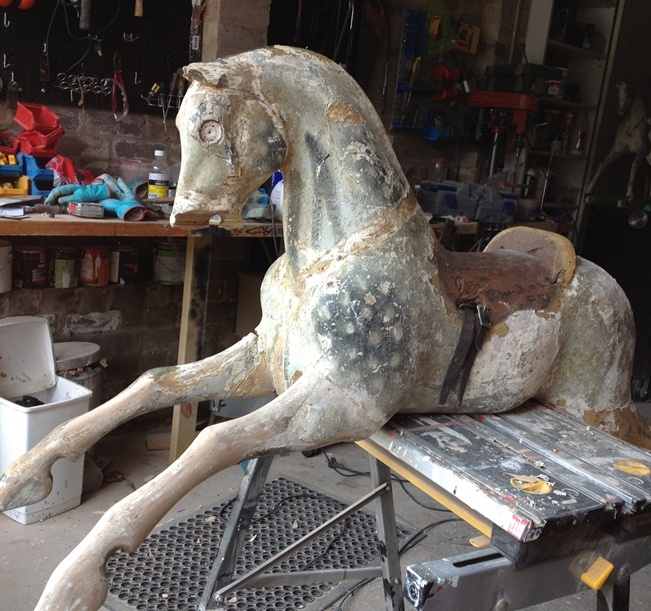 We always encourage preserving all original features (whenever possible and practical), respecting the horse's historical integrity and the value of paint and harness put on in a factory long gone. Please see the Conservation page. When a frail or abused horse needs drastic help, however, our work ranges from conservation to full strip, repair and renewal. 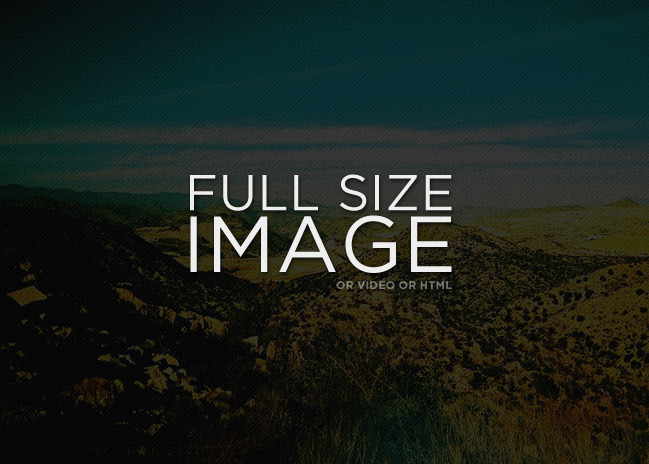 We strive for our work to look the same as if it had come from the factory. 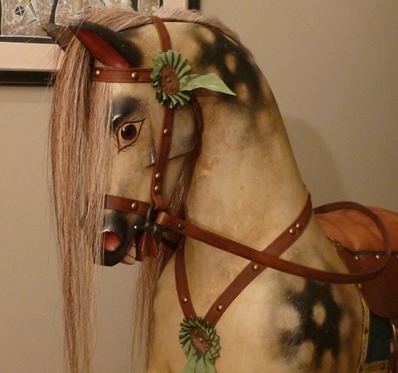 We retain all original details we can and replacement parts are the best replicas available. Sometimes we have to use a best guess when details are unknown, in which case a harmonious whole is the aim. 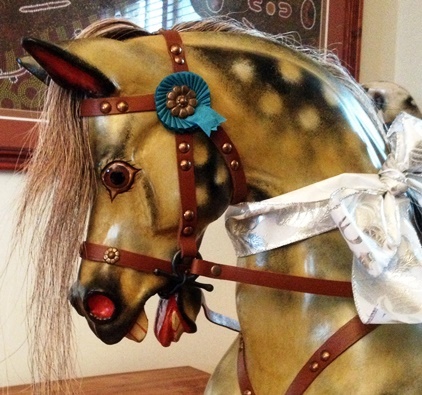 We take utmost care to make a horse structurally sound for many years to come.We do NOT simply put new paint on, we undertake all remedial and preventative repairs necessary to see a horse well into the future. 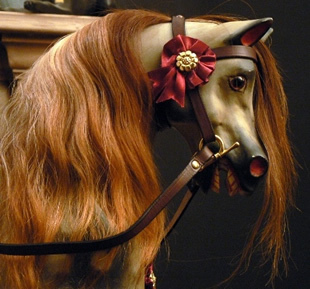 We can even rebuild a horse that has fallen apart. We use an ancient recipe for gesso, still the most durable (Egyptian mummy cases and statues were coated in this same substance!). 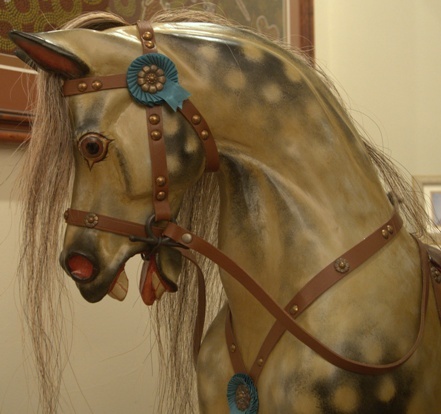 Dappling is done by hand or airbrush, according to how the horse was painted originally. This is a small home-based artisan workshop where most work is bespoke restoration, and if workload permits we do restore client horses. Currently no vacancy, sorry. Pimpernel had one missing ear and awful overpainting which, when gently removed, was found to be covering considerable original paint. This was conserved, then missing sections filled in to match. A new ear was carved, stand was stripped and re-finished and the flaking ironwork rechromed. 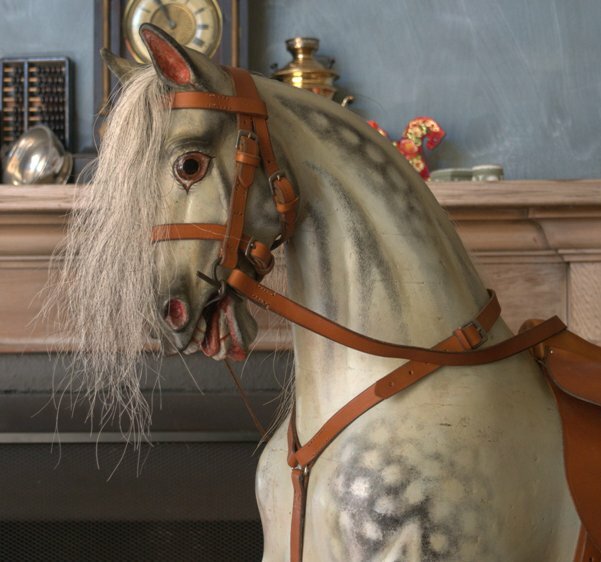 Although Pimpernel still had his saddle, he has gone on to be ridden again and we decided a sturdy new saddle was more suitable and he was fitted with replica tack. A very rare special extra carved Lines with additional carving on legs and rump. 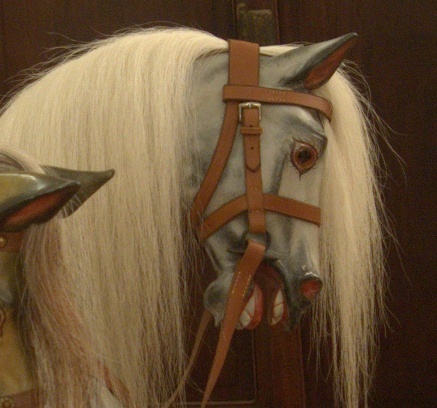 Magnus was virtually shattered when he arrived, and had extensive rehabilitation. 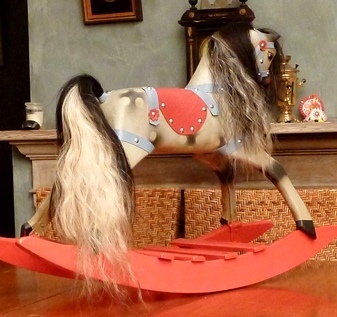 He is now a working rocking horse and enjoyed again the way he was meant to. Lines Sportiboy, "Edmund" was in such poor condition when he arrived it wasn't immediately apparent what he even was. Edmund had suffered some serious damage and had to be pulled apart to repair broken pieces and cut new limbs. Once reassembled, Edmund was painted in G&J Lines style (not strictly accurate for a Sportiboy but he has such a strong Lines look about him it was irresistible). 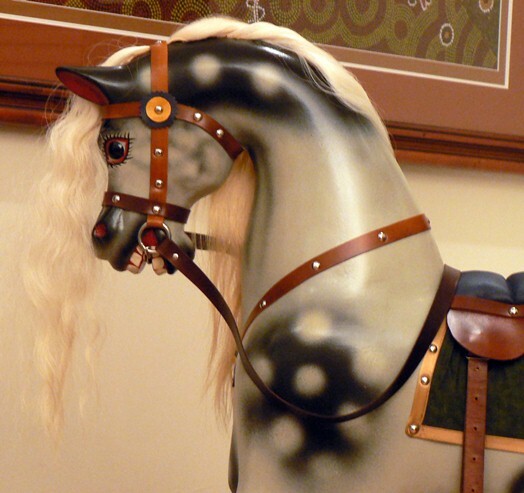 New tack, including a removable saddle, is a replica of what he would have had originally. 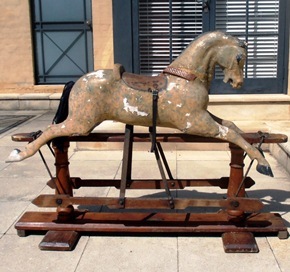 All that remains of Edmund's original stand is the swing irons and bowler hats, he came with only hoof rails which unfortunately were too damaged by woodworm to reuse, the rest of the stand was lost years ago. 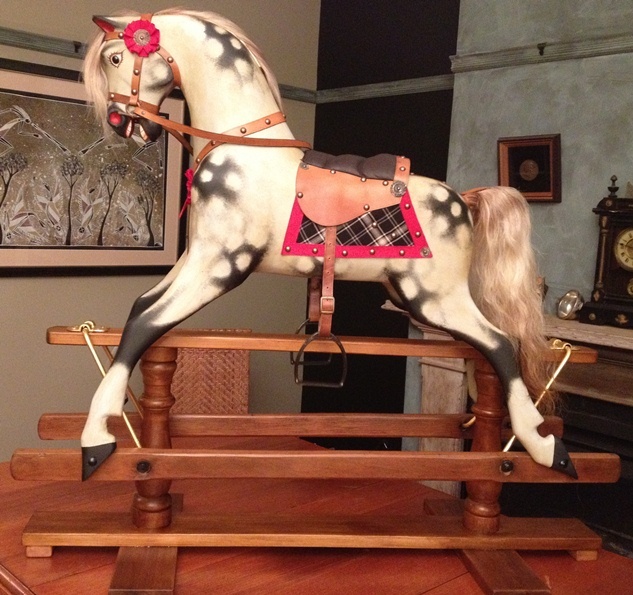 His stand is a replica Sportiboy stand, finished in French polish. Fully restored 2012. 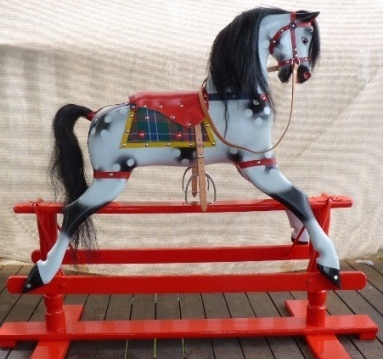 All that remained of the stand was the hoof rails and metalwork, a new stand that is a replica of original was built in Kauri pine to match the remaining original wood. 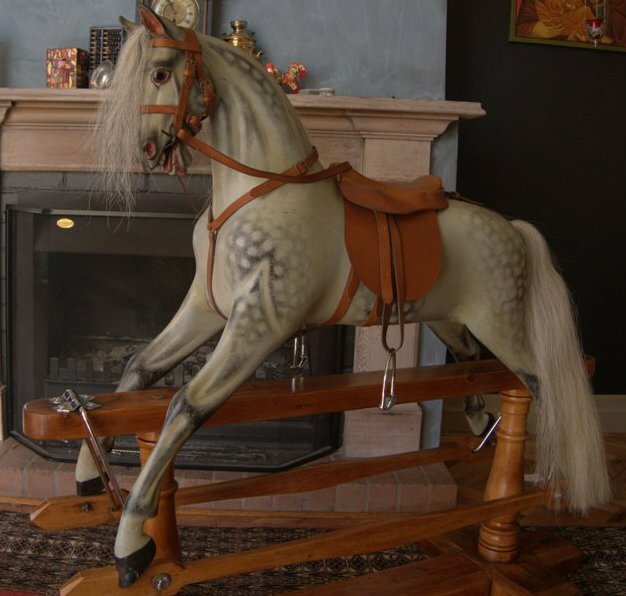 Rapture is a very unusual and early Ayres rocking horse, with a remarkable, almost unknown stand design. 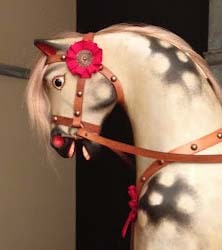 She has beautiful carving and a lovely, jaunty demeanour. We were thrilled to find quite a bit of original paint under the disastrous overpainting. Given the state she was in we didn't expect anything at all under the dreadful brown goo. What remains will be preserved as best we can, missing gesso will be filled in and new paint matched to old. A scrap of faded saddle cloth was enough to work with. 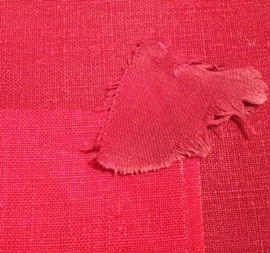 We matched the fabric fibre and texture, but the colour wasn't quite right so it was hand-dyed to match.